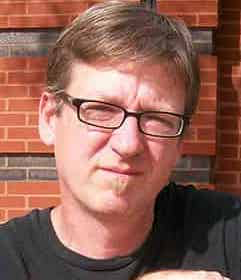 Derf Backderf is an award-winning, international best-selling graphic novelist, most notably known for My Friend Dahmer, which has just been adapted into a movie. Derf sold his first cartoon for $2 dollars to a classmate in sixth grade. Today he is a critically-acclaimed creator of best-selling graphic novels. The writer-artist, who works out of an attic studio in his Cleveland home, grew up in a rural, small town in Ohio, an experience that was the inspiration for his graphic novels Trashed, Punk Rock and Trailer Parks and the international bestseller, My Friend Dahmer, which will soon be in theaters as a film, starring Ross Lynch, Anne Heche and Vincent Kartheiser. His books have been published in nine languages. Derf Backderf's comix have appeared in The Wall Street Journal, The Village Voice, The Chicago Reader and The Los Angeles Reader. His work has been displayed in museums and galleries worldwide. He has won an Eisner Award (the Oscars of comix), a prestigious Robert F. Kennedy Journalism Award, several honors from the American Library Association, and four European book prizes. The Derf Collection, comprised of three decades of original art and papers, is part of the Billy Ireland Cartoon Museum at Ohio State University. Think comics are simply word balloons and drawings? Think again. Comics creator Derf Backderf demonstrates the boundless possibilities of graphic narrative with this fascinating talk about the making of his critically-hailed, international bestseller, My Friend Dahmer. A groundbreaking combination of memoir and investigative journalism, Derf’s book tells the haunting true story of his teenage friendship with the strange boy who would become the most infamous fiend since Jack the Ripper. My Friend Dahmer is one of the most memorable graphic novels of the past decade, winner of one of the American Library Association’s highest honors and four European book prizes. It has now been adapted into a film that was the hit of the 2017 Tribeca Film Festival and is slated for a nationwide release this Fall. My Friend Dahmer is not the terrible story you know. There is no violence, no grisly crimes. It’s the story before that story, one of a dysfunctional boy who fell through the cracks while an indifferent adult world failed to intercede. In this talk, Derf details the 21-year-long journey from the stunning news of his boyhood friend’s arrest to the publication of a graphic novel that set the book world abuzz. Derf started with his own high school journals, then meticulously expanded his story with research, interviews and detective work, and used the wonderfully expressive power of graphic narrative to craft a tale that leaves readers stunned, troubled and questioning their assumptions about the nature of evil. Learn how Derf did it, step by step, and the surprising discoveries he made along the way. No blogs posts yet. Check back soon!